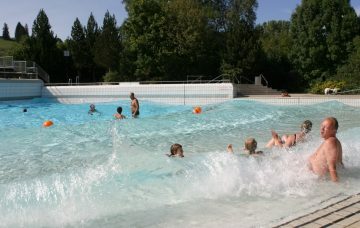 Visit our popular, heated outdoor wave pool in the heart of Peiting. 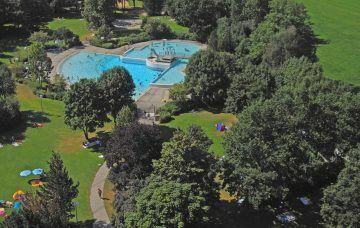 Relax and enjoy the wave pool or ‘non-swimming’ pool, which is situated higher up and features a slide and water play area. Get active on the beach volleyball court. The paddling pool and climbing frame in the children’s playground are perfect for kids. 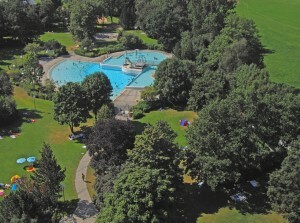 The large playing field and sunbathing area in the spacious grounds ensure visitors have plenty of privacy. Fun, games and enjoyment – Wellenfreibad Peiting has it all! Hourly wave machine – fun for the whole family!! 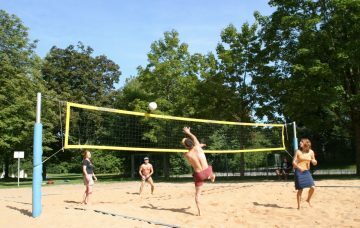 Beach volleyball court, climbing tower, table tennis, outdoor chess – there’s so much to do!